Apple Inc. officially introduced Business Chat in its latest iOS beta release for 11.3. It brings new functionalities to the Messages and integrates well with other core applications Apple Pay, Calendar and Maps (Refer to our insight here). The company is playing catch up to established competition from Facebook, Twitter and imbedded chatbot applications. Find out more about the competition and how the airline industry has embraced the technology to offer more choices to engage and upsell. Business Chat will be in direct competition with Facebook, Twitter, and chatbot clients imbedded in a company’s website. 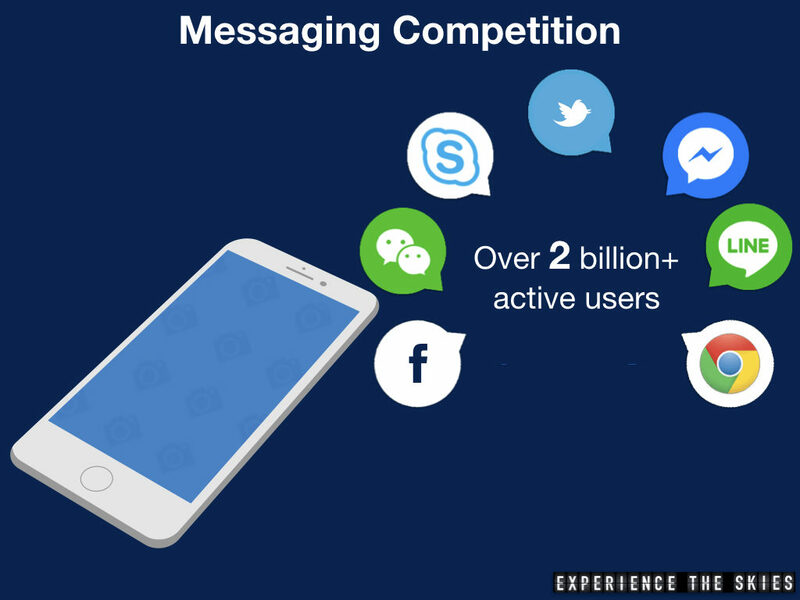 When combined, there are more than 2 billion+ active users using the messaging applications with Facebook Messenger, Apple Messages, WeChat and Whatsapp being some of the most popular. These applications take up very little storage space and have many of the same functionalities as Business Chat. Twitter is in the mix as airlines use it to communicate directly with its customers on operational disruptions and a level 1 support tool. Of all the available platforms, Facebook Messenger has received the most development time from airlines. KLM Royal Dutch Airlines was one of the first to integrate a chatbot function within this platform back in 2016. At launch, passengers were able to buy a ticket (they would be redirected to KLM’s website), check flight status using their PNR, get flight notification and boarding pass. In 2017, KLM extended its lead in the chatbot race by introducing a new emoji feature that is unique for the airline. By entering an designated emoji (e.g. burger for fast food), passengers would be provided a list of recommendations in real time designed to ease stress in a foreign city. Majority of these airlines provide flight related services like status and booking (e.g. Aeromexico) with Qantas Airways having a travel concierge service. Most of the chatbots were implemented in the last 15 months and their functions. There are also a small number of airports like Frankfurt Airport that designed a chatbot to provide updates on flight status and airport operations. Many including American Airlines and United Airlines have official Twitter accounts serving multiple purposes. They include updating customers systemwide during major disruptions, broadcasting news and achievements and interact with customers directly to resolve specific issues. Response time can be faster then using phone channels and the social media team is trained to assist in certain matters such feedback on bad experience, flight delays causing misconnection, etc. In general, airlines have not published what can be handled by the Twitter team in details. As such, customers may not be aware of this channel to get easy questions answered or directly interact with a live airline agent. 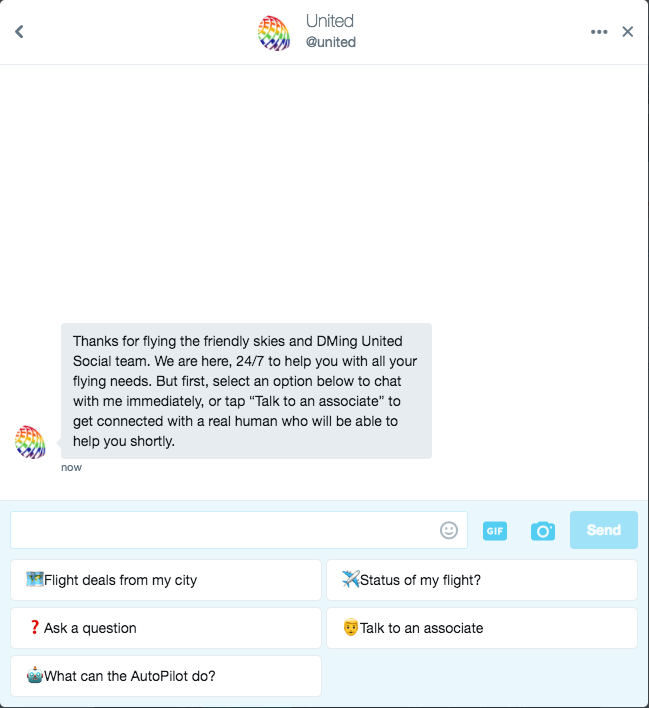 In the example below, United Airline’s AutoPilot bot has the ability to provide flight deals, check flight status, check for baggage carousel, answer common questions or direct the passenger to speak with a representative through the Direct Message feature within Twitter. Some businesses implemented their own chatbot and imbedded the functionality on its main website. Many of these chatbots include artificial intelligence and ripped to be included as part of a blockchain. 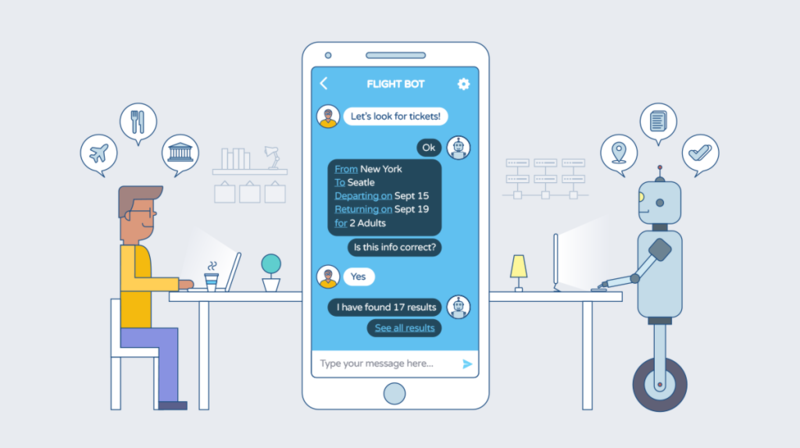 Air New Zealand created a chatbot aptly named Oscar (Bravo Oscar Tango) to assist its customers on Air New Zealand Lounge operations, Airpoints™ and baggage queries. The airline has plans to integrate Oscar with its Air New Zealand Mobile application. The jury is still out on which messaging platform airlines should concentrate their resources on. They will likely gravitate towards one that provides the best customer experience, the lowest development and maintenance cost/time, the highest scalability and the best integration to their systems. Apple Business Chat, Facebook Messenger and Whatsapp may have a slight lead on development considerations in the US as many airlines (refer to post) have started providing free access to these applications on board. 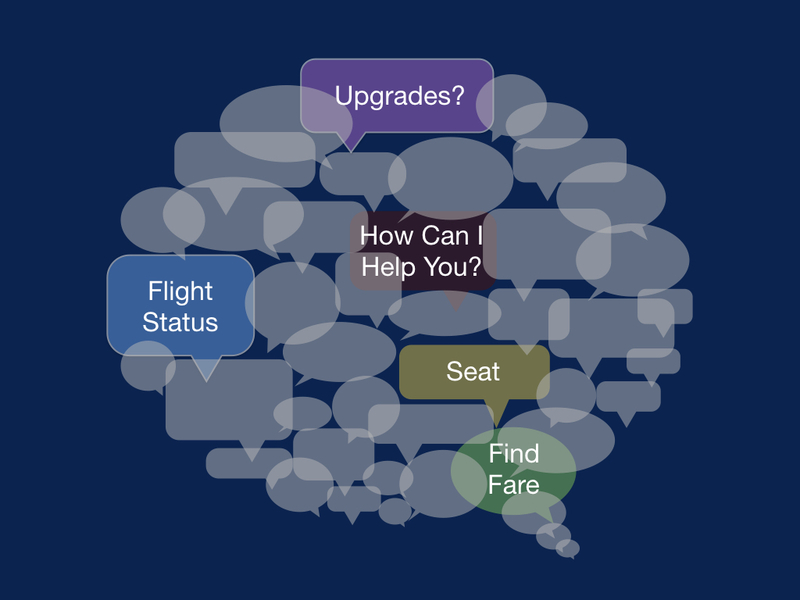 Delta Air Lines will be an early adapter to Business Chat as it prepares an upgrade to its communication technologies with this direct replacement of Delta Assist on Twitter. In a future post, we would look into the differences between virtual assistants and messaging applications, and what type of services airlines can offer.